Nazmi Demir; edited and abridged by CIMMYT. Correct citation: Demir, Nazmi. 1976. 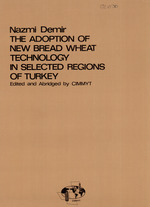 The adoption of new bread wheat technology in selected regions of Turkey--Edited and abridged by CIMMYT. Centro Internacional de Mejoramiento de Mafz V Trigo. Mexico City. vi + 27 p.
varied set of experiences--e.g. programs with and without discussion in the text of each abridgement, the hypotheses irrigation, wvth and without effective price guarantees, could be treated once in an abbreviated form for all studies. with massive extension effort and with virtually none. That treatment follows below. assumption about farmer behavior. The assumption is development and diffusion of new technology. above, we might expect to see relationship between the factors played prominent roles. Somewhat more arguable is the relation of age and family since their inception, the opinions expressed by the authors size to adoption. Even here it is likely that only a few are not necessarily endorsed by CIMMYT. would argue that these relationships might be positive. roughly 50 percent of the calories and a bit over 50 per- three fourths of the fallow lies in the South East and the cent of the protein in the diet of the average Turkish Anatolian Plateau. another 8.6 million hectares-is added to this, the wheat hectares, with all of this returned to pasture. of GNP, and supplies nearly nine tenths of the country's opportunity for irrigation. part of the winter wheat producing regions. in two quite distinct environments. The largest contributor, rainfall, ranging from 500 to 800 millimeters per year. of HYV production, a full set of locally-produced recoinCoastal Spring Wheat Programs mendations became available. active, guaranteed market for Their product. By 1969 descriptions of new research are the topics of the final HYV's were estimated to be on over 600,000 hectares for chapter. The Thrace, South Marmara, Aegean, and Mediterranean regions of Turkey and the surveyed counties within each region. terranean Region, irrigation is available but little is placti- dlea. Annual avviiigqe pi ':ilpitalion i; 590 millimelwis, disim ced on wheat. The region accounts for some 7 percent buted as shown in Figure 1 (data from 1967 to 19/1). Fig. 1. Average monthly millimeters of precipitation by region (1967-71). Table 1. Characteristics of sampled wheat farmers by region. a! Range: 1-7 (1 = no education 7 college education. b/ Field days, lectures, and demonstrations. c/ Membership in any of several agricultural societies ranging from co-ops, 4-H clubs, etc. Table 2. Characteristics of farms of sampled bread wheat farmers. a/Virtually all durum farmers eliminated and those durum plots included are not considered as part of bread wheats. Table 3. Percent of fields and percent of area devoted to various varieties on sampled bread wheat farms, by region. a/Conte x Marzotta, Mara, and Libellula. bi Penjamo, Lerma Rojo 64, Super X, Sonora 64 with Penjamo by far the most prominent variety. c/ Other includes land race varieties and pre-dwarfs improved varieties, largely Turkish. Local improved accout for about one-fourth of other in Aegean and nearly one-third of other in South Marmara. Several statistical techniques were used in analyzing the and rolling land. area is larger than percentage of fields. 2(1 percentt of tihe total plant nutrients used in agricui;ure. nutrients applied to all wheat. Even so, there is yapq; By 1972, wheat was estimated to take up 60 percent of all some way to go before applications reach recomnisl nutrients used in agriculture. Based on the survey results levels, which are 160-200 kg/ha for HYV's and 120 14(0 the four regions under study used nearly 30 percent of the kg/ha for other varieties. clusions it will be seen that differences among regions ory a few observations for each combinations of elements. An earlier study undertaken by the Ministry of Agricul- of errors in reporting yields. cent in local varieties and that tie price of straw is 30 per- Table 5. Average yields (kg/ha) of bread wheats reported cent of the price of grain sampledd farmers ieportled prices by sampled farmers for 1971-72 by variety, fertilizer use, varying from 25 to 35 percent). Then the added grain and agro-climatic zone. and Other varieties are low e.g. Thrace hillsides. yields of ordinary varieties leaves the net extra yields data reported. c/Fewer than 10 observations. These calculations-based on farmers' reports of yields, an assumption about grain partition, the assumption that average fertilizer use within the respective fertilizer groups Table 6. Grain equivalent of extra straw produced by is the same for HYV and other groups-indicate that HYV's, HYV's as implied by yields of Table 5. South Marmara hillsides that it has given to HYV's for other costs. Table 8. Farmer practices by type of wheat and region in 1971-72 production. Thrace shows up quite well except for split applications applied to Bezostaya-that yields are unstable because of of fertilizer. This may well be a less critical problem for the moisture stress-is niot applicable. Farmers of these two winter wheats and the rainfall regime of Thrace than in regions respond with high adoption rates and also are the spring wheat regions. using heavy fertilizer applications. was on the order of 10 percent and is attributable to the latest frosts. red grain of the Mexican varieties. This gives a reddish On the other hand, late seeding can also be undesirable. 5 is over 25 percent. Since other costs must be netted are clearly not part of a homogeneous agro-climatic zone. the minds of some farmers, the new varieties are suspect Mediterranean Region with 63 percent and considerably because some of them manifested great susceptibility to lower in Aegean and South Maramra. This is consistent this now-and-again scourge of wheat growers in the Medi- with the higher adoption rate of HYV's in Mediterranean terranean littoral. and lower adoption rates in Aegean and South Marmara. Discussions with scient ists2 indicate two different stages with respect to fertilizer use but this might be influenced in wheat's growth cycle. At these stages minimum amounts by the higher temperatures and evaporation rates of the of moisture are critical. The first critical stage is at crown Aegean. These conditions can impose an even greater root initiation, which starts 3 to 4 weeks after seeding. The need for moisture in that region than in South Marmara. second critical stage is at flowering and early in the seed With this, the threshold level in South Marmara might filling period. This usually occurs some 130-150 days after be overstated relative to Aegean. If so, the probability of seeding, depending upon the environmental conditions, achieving threshold levels is understated. Table 9. Estimated probability that rainfall will exceed specified threshold levels by region. a! Percent of fields under HYVs. risk might be influencing the adoption of HYV's. It was Bugdayinin Mukayes eli Ekonomik Analizi (1967-68), Tarim Bak. with higher rates of adoption. Rajaram at CIMMYT, Mexico. of these factors in two-way tables. In the following chapter classes, the effect of farm size is usually positive. There we present the results of multivariate analysis of the effect are two exceptions to this, that in Mediterranean flat lands of the factors on adoption when considered simultaneously, is small while that in South Marmara flat lands is notable. that between smaller and larger farms in Thrace. variety from Mexico, occupied 70 percent of the coastal topography exceeds that of farm size. area seeded to HYV of bread wheats while Bezostaya ac- Age, education, and membership in agricultural societies. Within regions and holding farm size constant, the effects education of those who use other varieties. sub-regions and proportion of sampled farmers in each size of farm, b region, and topography b (percent). some kind of association being members of cooperatives. Region suffers little from either. It should be noted that age and education are negatively the higher hills where frost threatens the early maturing correlated for Turkish farmers. The simple coefficients of Mexican HYV's more than the later Italian HYV's. correlation are -0.52, 0.45, -0.43 and 0.61 for Medterranean, Aegean, South Marmara, and Thrace regions respectively. diseases than are local varieties. For example, late frosts Table 12. Age, education, membership if farm organizations, were described as having more serious consequences for and adoption of HYV's by region for sampled farmers. higher hills and in South Marmara followed by Aegean than society. constructed for each farmer. The index is the ratio of between adopters and others within topography classes but bad and normal yields divided by the relative probability the limited number of observations makes these comparisons which the farmer assigns to bad and normal weather.' dubious. Seed availability and credit. Government influenceson the government to protect farmers from the vag~iries of the production of seed dates to 1963 when a seed produc- adverse price fluctuations, it is sometimes said that not all tion and certification law was passed. Responsibility for farmers have access to the protection offered by the goinsuring quality seed falls to State Farms. These farms vernment's wheat trading agency, IMO. In particular it is produce seed and also gather the seed of contracted farm- said that Aegean and South Marmara farmers do not find ers. They inspect, clean, treat, and bag the assembled seed these services available and that, because of apprehension which is then sent to seed laboratories for testing. Seed over the marketability of the red grained Mexican wheats, distribution is carried on by several cooperating govern- these farmers were reluctant to adopt improved varieties. mental agencies. To examine the validity of these statements two marketSeed production and sales reached 200,000 tons in 1969. ing variables were included in the analysis. A second factor which might limit the use of HYV's wheat. All but one of these sold wheat to private dealers. is the distance which farmers must travel in order to ac- Of the seven adopters, four sold wheat and one of these quire the seed. For both Aegean and South Marmara, the sold to IMO. This all might mean that the emphasis on distance to a source of HYV's is lower for adopters than private sales led the farmers to prefer local wheats over for others. In the case of Aegean the comparison is 14.6 H YV's. km. vs. 15.2 km while in South Marmara it is 16.9 km. vs. While the preceding conclusion is not completely con28.3 km. Again, however, the pattern is made less mean- sistent with the absence of price differentials reported by ingful by the average distance reported by adopters in farmers surveyed, it does fit other data which suggest that Thrace, 19.9 km. This is considerably greater than the while prices of the two wheats tend to move together, for distance reported by non-adopters in Aegean. some markets IMO does not operate for long periods. Table 14. Extension services by region and by class of markets in the diffusion of HYV's. seed (percent of farmers). Aegean HYV's 82 26 54 and percentage reporting sales of wheat. farmers cross classified by farm size, region, and topography (kg N+P2 05 per ha). Fertilizer use in wheat has increased dramatically in Turkey. South Marmara Hillsides 44 60 to buy a kilo of nitrogen. Half of the nitrogeneous fertilFlat lands 57 53izers were produced domestically, half were imported. Thrace Hillsides 91 106 Benefit/cost ratios estimated by State Planning Organization were favorable to wheat, on the order of 3, but were even better for such crops as beets (4), beans (5), rice Table 17. Fertilizer use on wheat by sampled farmers (10), and cotton (11). ______________________________________________ ers sometimes use more fertilizer than do hillside farmers a/ See Table 10. and sometimes the reverse. Medierrnea Aegan Mrmar Thace all regions, topographies, and farm size groups. It is unMedierrnea Aegan Mrmar Thace doubtedly connected with research results which show that Members 151 47 53 102 HYV's are more fertilizer responsive than local varieties. Fertlizr us Meiteranen AeeanS. Mrmaa Thace too, it has undoubtedly had some influence..
Mediterranean HYV 33 55 found. Membership. Age and education as they related to fertil- all South Marmara and Thrace farmers responded). agriultralsocetis ws cnsidredandtheresltsare purchase of fertilizers. Judging from the column "Own funds"
shon i Tale 8. t i clar hatmemersuseappecibly there is not much variation among regions except that so wn ine Tble 18tha isclarttmembers useahofte app rebl South Marmara appears to be somewhat lower than others. thatsocety embrs ave asir acessto redi an to an important role in Mediterranean Region while cooperathatiloc ietsember thave easin-emaces.oceitadt tives dominate financing in the remaining regions. Availability and credit. While the use of fertilizer has fertilizer use are included in Table 23.
service by region and fertilizer use (percent). services by region and farm size (percentages of farmers). tually all elements, are notably lower than those in Medi- Other Elements of the Technology. low rates of adoption of HYV's and fertilizers, of HYV's by region. The results are seen in Table 25.
is cross classified by region and farm size. assistance of cooperatives or other agricultural agencies. participation but low rates of adoption. Mediterranean local variety growers. Table 25. Farmers reporting certain practices classified by class of seed and by agro-climatic region (percent of fields). al Recommended date for varieties from Mexico. bi Winter wheats seeded earlier in the fall. are complying with the recommended seeding dates. Aegean to have shown less hand casting of fer tilizei than Aegealn. tenuating circumstances. First, some 20 percent of the plications of fertilizers than are users of other varieties. Mexico are sowing in the spring. Thus, if all remaining HYV users. planting time is also reduced. sensitive hence the date of seeding is not so ci itical as with the farmer expects in bad and normal conditions, and Pb and Pn Mexican varieties, are the probabilities the farmer assigns to bad and normal conditions. do users of other varieties, but, except for South Marmara, 3. L.G. Telser. 1955-56. "Safety first and hedging," Review of the differences are not large. The quite substantial differ- Economicstudies, 23:1-16. ence in weed control seen in South Marmara is not readily 4. S. Kataoka. 1963. "A stockastic programming model," Econoexplainable. metrica, 31:181-196.
not easily considered in two-way tables. Second, multivariate least squares can, however, be quite unsatisfactory for the analysis allows us to estimate the effect of any one variable analysis of a dichotomous variable such as the adoption of while holding others constant. Finally, we are able to HYV's. Table 26. Description of variables used in regression and Factors Affecting Adoption of HYV's. logit analysis of adoption decisions. pct wheat: Percent of farm allocated to wheat Table 27. Discussion is based on logit results. demonstrations; 1 = yes, 0 =no. percent more likely to adopt than were those who did not. above 1.0 in all cases. In presenting results, logit coefficients have been convert- HYV's, and an increasing ability to make use of this knowed to direct probability estimates so as to be comparable ledge. Family size also had a positive effect on the probato the ordinary least squares estimates. In each case, the bility of adoption, with each additional person increasing coefficients presented are to be interpreted as the change in the probability of adoption by 1 to 2 percent. This was the probability that a farmer will adopt HYV's as a result not anticipated, and we can present no rationale which of a one unit change in the independent variable. could explain this positive (though small) relationship. t-ratios for the logit coefficients are those corresponding to the estimated coefficient of the logit model itself. b/ In South Marmara, all four farmers who sold grain to the government were also adopters, and the logit procedure does not permit estimation of a model including this variable. c/ In Thrace, all seven valley farmers were also adopters, and the logit procedure does not permit estimation of a model including this variable. estimated as to be deemed negligible. the effects of topography and farm size appear to be underFarm characteristics. Each of th e farm characteristics estimated compared with the other regions, so it is possible considered was important in influencing farmer adoption that some of the effect attributed to tractor use in S.
decisions in at least one of the areas. The most important of Marmara is actually attributable to valley topography and these factors was topography in Aegean and Thrace, with larger farm size among the farms using tractors. the flat lands and if most adopters also live in the flat lands; hectares or so, the distribution of farm sizes in Aegean was it can be very difficult to determine which factor, weather such that a farm at the 98th size percentile (about 17 ha) risk or topography, is most closely related to the decision would be only about 10 percent more likely to adopt than to adopt. Since the estimated effect of weather risk in S. an average sized farm (about 6 ha)l.
Factors affecting application of fertilizers. Fert. Avail. Characteristics of the farm had no consistently important Thrace, seen in Table 28.
farmers had adopted HYV's. It should be acknowledged with the data of Table 16. Distance to field is also consistthat results from models with HYV's are less easy to inter- ent but is positive in all cases, the reverse of what was pret than were this variable not included because HYV use expected. relevant coefficients are negative in tvvo~regions, the op- the expected positive sign. For all four regions the sign posite of what was expected. of the estimated coefficient is positive. with expectations. For three regions, the estimated coef- to its use. its sign is contrary to what was expected. For all but the one region, South Marmara. of other income is negative and it was hypothesized to be Chapter V conform quite well with the tables of Chapter IV. Table 5 which suggests that high rates of fertilizer applica- education, weather risk, family size, percent in wheat-show tion don't pay for farmers there. Table 5, which is based great inconsistency with half being positive and half negative. on farmer's reported yields, is not consistent with the rates Of the remaining seven variables, other income and topograof fertilizer application reported for Thrace in Table 16. phy show tendencies contrary to those expected. pretation by the low coefficients of determination, it can Mulrivareare Log-Linear Logistic Models, The Rand Corporation, still be said that regional differences in fertilizer use are Santa Monica, California. notable, tending to following the pattern of the adoption 2. A more dlesireable econometric approach would be to of HYV's, i.e. ranking regions by percent of land in HYV's estimate the fertilizer decision equation and the hybrid decision is entirely consistent with ranking them in terms of equation together using simultaneous equation techniques. expansion since no unused land is available in the country. spring wheat regions, and Thrace, a winter wheat region. well to fertilizer and other production practices and produce Findings high yields under favorable climatic conditions. The purpose of this study was to look closely at the What follows are general comments. More specific stateadoption of the new wheat technology, emphasizing high ments are found in Chapter 5.
wheat technology from which the country can benefit, provision of resources and motivation. It should be emphaFirst, the presently available wheat area in the coastal sized also that extension workers should be supplied by regions is more than 1.7 million hectares. Contrasted the research workers and scientists with the precise into this the HYV's had covered 0.9 million hectares of land, formation about the new wheat technology before they Therefore, further area expansion of HYV's is feasible, are sent to the farmers. 60 percent of this potential on the average. With appro- easily accessible markets for their wheat. This could be priate farming practices farmers can also reach 4 to 5 tons done by increasing the number of state purchase offices of grain per hectare. and by locating them properly in their regions. To make use of the maximum yield potential from the any event, the overall supply of fertilizer will have to be innew seeds, timely and proper seeding is necessary. In creased to reduce the competitive use among several crops. As the findings suggest, farmer's membership in an agri- lands planted to other crops in the regions. To achieve cultural organization is associated with higher rates of adop- those aims will require new motivation and leadership.